The discipline’s historic prominence in China is underpinned by its crucial value to industrial processes. Committed funding sees it leading the way in emerging areas, such as nanomaterials. There were no research labs and no chemical testing devices when Lu Wei and colleagues joined the chemistry department of the new Southern University of Science and Technology (SUSTech) in Shenzhen in 2012. Their only teaching demonstration labs were in a makeshift building; equipment had to be set up and dismantled for each class. “Our graduate students had to cycle for several kilometres to test our samples in partner labs nearby,” says Lu, founding head of the department. As their labs took shape around them, lively discussions stretching into the evenings, sometimes with beer, sparked ideas between young faculty members, recalls Lu. Teams rearranged themselves in new combinations to stretch limited resources further by simplifying logistics. When state-of-the-art labs were built two years later, with generous funding from the Shenzhen municipal government, the young chemists at SUSTech quickly made breakthroughs, rising to be among the top 50 in China for high-quality chemistry research with a fractional count (FC) of 83.41 for 2015–17 in the Nature Index. One recent study in Science, lead by SUSTech chemist, Tan Bin, identified a catalyst that improves the efficiency of the chemical reaction known as Ugi, which has been widely used to synthesize compounds, especially in the search for new pharmaceuticals. 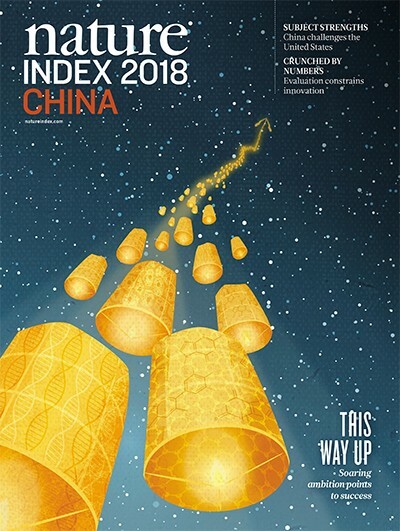 From 2012 to 2017, China’s FC in the Nature Index for chemistry grew by 84% from 2,712 to 4,993, ranking it as the world’s second after the United States. By contrast, the US saw a decline of 10% from 6,026 to 5,451. Among the chemistry sub-disciplines, China surpassed the US for top position in organic chemistry in 2015. It has run second to the US in most other chemistry sub-disciplines in recent years. 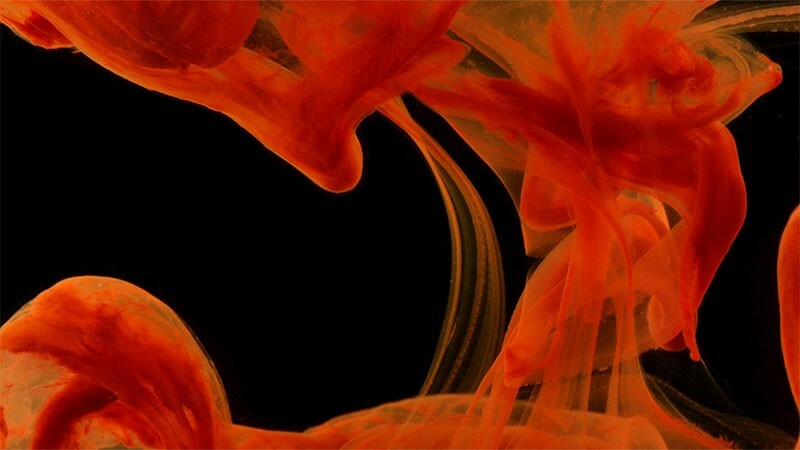 “The solid scientific foundation built by Chinese chemists over many years, the nurturing of young talent, and the state’s surging investment in research have combined to contribute to this significant growth,” says Chen Xiaoming, a chemist at Guangzhou-based Sun Yat-sen University (SYSU), who is also a member of the Chinese Academy of Sciences (CAS). Chemistry has long been China’s top-performing discipline in terms of international research publications. Its crucial importance to many industrial processes has guaranteed it sustained attention since modern science was introduced to the country, says Lu. Organic chemistry, which studies compounds and materials containing carbon, is the strongest sub-discipline, due to its “wide application, easier operation and huge number of researchers,” says Lu, adding that it is very cheap and quick to set up an organic chemistry lab. There has been rapid growth in studies on organic synthesis methods, nano-catalysts, synthetic organofluorine chemistry, visible-light-driven organic reactions, and natural product chemistry. So said a May 2017 special edition dedicated to organic chemistry of China’s most prestigious multidisciplinary journal, National Science Review. Ma Shengming, guest editor of the edition and a leading chemist at CAS Shanghai Institute of Organic Chemistry (SIOC), pointed out the great industrial and environmental benefits of many of these studies which involved interdisciplinary collaboration with emerging areas such as nanomaterials. For example, according to Hu Jinbo of SIOC, which topped the Nature Index in organic chemistry with an FC of 139.17 for 2015–17, Chinese chemists have made significant progress in improving synthetic organofluorine chemistry, which can reduce chemical pollution. In another example, visible-light-driven organic reactions greatly lower the energy needed for industrial organic chemical synthesis, wrote Wu Lizhu of the CAS Technical Institute of Physics and Chemistry in the special issue. The large recruitment of chemists particularly through the Young Thousand Talents Plan has provided a fresh boost to the booming study of chemistry in China, says Zhao Dongbing, a chemist at Tianjin-based Nankai University, who was enrolled as a scholar under the plan after completing his postdoctoral research at Cornell University and the University of Washington in Seattle. China launched the plan in 2008 to attract established scientists and high-tech entrepreneurs to return to China. In 2011, the programme was extended to young scholars, mostly targeting highly productive postdocs. By early 2018, China had recruited 3,535 young scientists through the programme. Zhao believes chemistry accounted for the second largest category of recruits under the plan, after the life sciences, though official numbers are no longer available due to political sensitivities over the recruitment of scholars from the US. Many of the returning postdocs “have good competency, smart ideas and can readily join hot research areas,” says Zhao. These Young Thousand Talent Scholars, including Zhao, Lu and Tan, contribute a large portion of papers from China published in top chemistry journals. For example Xiong Yujie, a chemist at Hefei-based University of Science and Technology of China, who was recruited in the first batch of Young Thousand Talent Scholars in 2011, has since published more than 100 papers, including a dozen in journals tracked by the Nature Index such as ACS Nano, Advanced Materials, and Angewandte Chemie International Edition. It is not clear whether the plan will continue to be of as much benefit to chemistry and other disciplines in China, given US accusations that it is a channel for the theft of US technology and intellectual property. Chinese authorities and universities have removed the name lists of Thousand Talents recruits from websites and some US-based Chinese scientists who might previously have applied have shied away from the scheme. Although figures for individual research disciplines are not available, China’s research and development expenditure has been growing, from 1.03 trillion yuan (US$150 billion) in 2012 to 1.76 trillion yuan in 2017, accounting for 2.1% of its GDP. China’s R&D surpasses that of many industrial countries in both absolute and relative terms. For example, in 2016 the R&D/GDP ratio of the United Kingdom was 1.67% when China’s was 2.08%. Surging research investment means that expensive devices, such as infrared and nuclear magnetic resonance spectrometers and elemental analys﻿ers, though unaffordable to many chemistry labs in the West, are standard equipment in Chinese research universities. 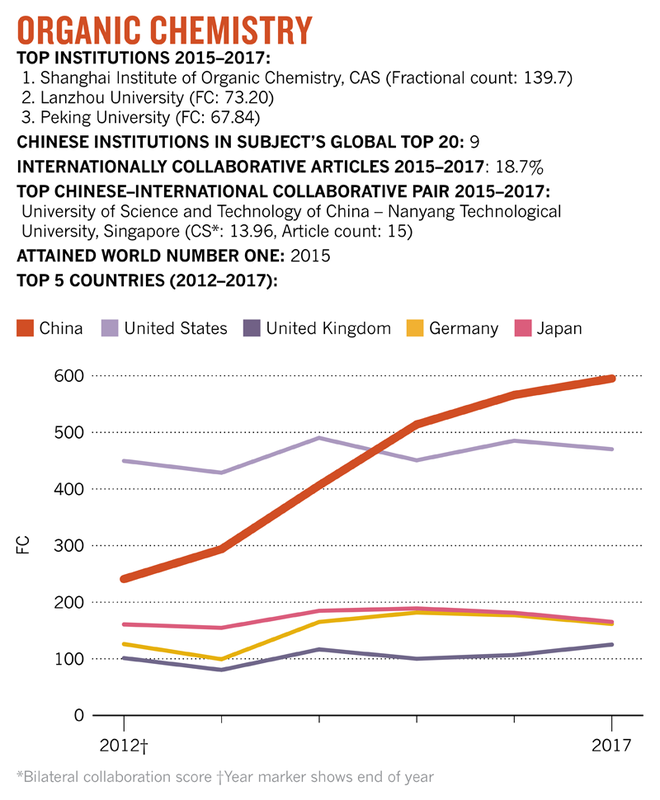 Chinese chemistry attracts the same criticism as Chinese science overall: that in the race to publish, China focuses on areas with international traction and quick results. Zhao acknowledges that the heavy pressure on young principal investigators to publish stops them from delving into the mechanisms underlying basic chemistry, because proving the science behind even very conventional chemical reactions is a long and arduous process.